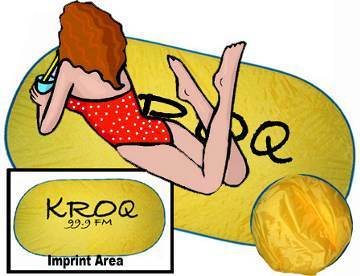 Personalized Nylon Beach Mats w/ Pillow, Custom Printed in Bulk. Promotional, Inexpensive. Budget Prices in the USA and Canada. Bulk collapsible Nylon Beach Mats, fold into matching zippered carrying pouch, 18" diameter. Imprint on pouch is also possible: contact us. 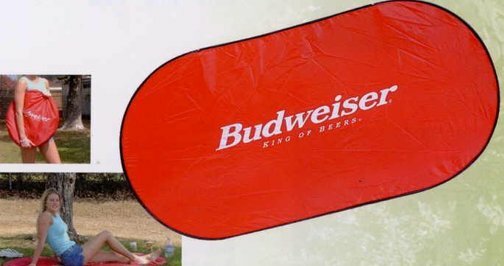 Budget Prices in USA and Canada for bulk personalized nylon beach mats. We also supply blank (not custom imprinted) nylon beach mats for $7.26 each. Tired of having sandy towels after laying out at the beach? Worry no more with our collapsible nylon beach mat as the sand rolls quickly off for easy cleaning. Comes with a matching pouch. Free artwork design. We will send you a proof for your approval before production. American clients pay no taxes. The unit prices below include your custom 1-color custom imprint. Add the amount shown in the price list for each extra color. We also supply blank beach mats for $7.26 each. Setup Charge: $85.00 per color (one time charge: you don't pay it for repeat orders). Blank Beach Mats: $7.26 each (minimum 50). Imprint size: 13" x 36"